In the interest of full disclosure, I should point out that I was connected to the development of this game, and although I do not stand to gain commercially from its success, my views are inevitably going to be subjective. Don’t consider this a review, just a gentle prod that this game exists. PRISM: Light The Way (not to be confused with P.R.I.S.M. – Threat Level Red) is a 2D puzzle game for Windows PCs and Java-capable mobile phones published by Eidos and available to buy right now: [PC version] [Mobile version] – although oddly Eidos haven’t (to my knowledge) advertised the game’s existence in any way. The story of the game (in so much as anyone cares about the story in a puzzle game) revolves around cute, stylised alien creatures that live inside a collapsed star and feed on the light rays that are slurped up by its event horizon. One day a space monster jams itself in their black hole (oo-er), blocking out the light and necessitating a race of do-gooding, light-spewing aliens come to the rescue. Of course, as none of these deep space creatures have limbs, the player (in the form of a disembodied cursor) must help them move around. Pieces can be dragged to any free space on the board (so you don’t have to shuffle pieces about as you would with a sliding tile puzzle) but cannot be rotated. 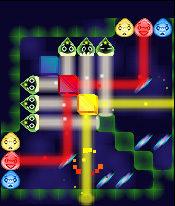 The game has several quite varied playing modes. 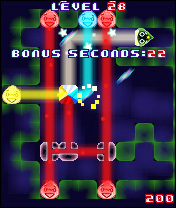 There’s the standard “time attack” arcade mode (where the player must clear randomly-generated levels to earn extra time), a free play mode which removes the timer, a puzzle mode where the player must complete increasingly difficult handmade levels, and (in the PC version) a very hectic shooting gallery mode where targets and playing pieces are dropped onto the board intermittently, and the player must constantly rearrange the pieces to hit all the targets before they go critical. The game controls are obviously well-suited to the mouse, but the mobile version doesn’t fare too badly either, allowing the game to be played quite comfortably (depending on your handset) with one thumb using the directional stick/pad. (The game has been designed to be as platform agnostic as possible, leaving the door open for ports to other systems in future.) The visuals are crisp and clearly laid out (although obviously not mind-blowing) and the music (courtesy of Richard Joseph of Sensible Software fame) is suitably laid back and atmospheric. As the disclaimer says, it’s difficult to write about a game when you’ve borne witness to it’s development. Not just because of the nagging feeling that you might be subconsciously giving the game the benefit of the doubt, but also because it’s not obvious how much of the developers’ intentions have made their way into the finished product. 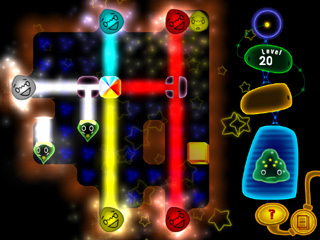 For instance with Prism, there was a lot of emphasis during development on the idea of being able to create and trade levels, features which don’t appear to have made the final cut. Also, having seen the incremental improvements made to the game, it’s difficult to view it with fresh eyes. Of course, most of you reading this won’t be burdened with these problems. So I leave you with the immortal words of Neil Buchanan: go on, try it yourself.